Harrington remembers Torrance: “It’s a day to remember the great things that Bob did"
It hardly mattered that he didn’t make a birdie and missed the cut comfortably after a sad 78. Padraig Harrington only had words of fondness rather than sadness after hearing at the finish that the coach who made him a three-time major winner had passed away. “It puts it in perspective,” said Harrington of his day on hearing that the great Scottish maestro Bob Torrance had died at the age of 82 after a seven-month battle with lung cancer. “He was a like a father to me,” Harrington said. "His passing is not to be mourned. He did this game a great service. He loved it and whomever came in contact with him, walked away with a better experience. Isn’t that a fabulous way to go out of this world? "He was a fabulous person to be around, exceptionally entertaining and always in a good mood and a good frame of mind. He gave so much in terms of the golf swing. I think it was a great life." Harrington had a poor swing when he started working with Torrance in 1998, hitting low cuts, and transformed himself into a fine ball-striker, going on to win three majors. “It would never have happened without Bob,” Harrington said. “Absolutely not. He was a critical part of me winning my major tournaments. 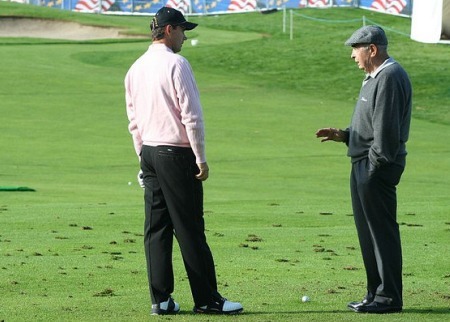 “You’d want to see the kind of ball striker I was before working with Bob. He did a phenomenal job over those years. “I completely rebuilt my swing under Bob Torrance. It was always a joy to do it and a great experience to work with Bob. "As sad as Bob’s passing is I cant help but have a smile on my face at some of the stories. We all have so many stories about Bob. It will be the best wake of all time. He touched everybody who came across him with his love of golf and his humour. "Many of us will be happy to live our life the way he did. He definitely lived it to the fullest. For myself, going to see him a few weeks ago was the hardest part, the saddest part. After seeing him, I knew this was coming. "Wow. The story of Bob’s life, wouldn’t that be a story. Have I got stories? There's many a great story but most of the can’t be published. "He lived his life to the fillest. There’s no doubt he got a second lease of life in the late 90s and often times he’d come out looking better than ever. This was definitely one step too far. "When he was diagnosed at Christmas with cancer, he had overcome everything else and you though, 'Ah yeah. Bob can survive this.' But when I last saw him it, as much as he wanted to fight it, there was inevitable end to it. "Everyone has a story about Bob, even the guys he didn’t coach. He’d teach anyone for any reason and never charged them a penny for it up there in Largs. He was like a father figure to so many people. "He was a father figure to me too, no doubt, after my own father’s passing. “It was a sad day a few weeks ago when I went up to see him in Largs. Knowing Bob’s pride, which he sure had, it was better for him not to go on too long. He wasn’t getting treated for the cancer and he’s got such pride that you’ve got to think that he watched The Open all the way to the very end. “But I can’t say it’s a sad a day today. It’s a day to remember the great things that Bob did. He gave a huge amount in his life and we all gained a lot because of him." The pair split up after 12 years together during at the Irish Open in Killarney in 2010 with Torrance insisting that Harrington was “going down the wrong road” and that he couldn’t make swing changes after 40. Harrington said: “I thought the world of Bob and it was a very difficult thing that I split up with him. I thought the world of him personally and always have. He was a joy to be around. “He is one man whose life can be celebrated. He made a big difference to a lot of people in a great way. Darren Clarke carded a second successive 72 to trail leader Rory McIlroy by 11 shots but still had thoughts for Torrance. Clarke said: “That is bad news, such very sad news. When I played in my first Irish Open as an amateur in 1990, it was with Sam Torrance and DJ Russell and Sam told me I’d got to start working with his dad and I did. “I spent so much time in Largs with him and June. Bob was a free spirit. He enjoyed himself. He was a wonderfully knowledgeable coach and he was a really good man. As golf lost one genius, it may have gained another in leader McIlroy with Clarke convinced that his former protege will be a tough man to stop as the takes a four shot lead over Dustin Johnson into the weekend. “It's wonderful,” Clarke said. “He's had some tough Fridays and you guys keep reminding him about his tough Fridays but it's great to see him go out and do what he's doing today. “He's a great kid, a talented kid and if he keeps playing the way he is, he is going to be a very tough man to catch.